It's June and cycling season is well underway. Here are Five Things to Know about riding in and around Rockland County in June. June 2018 RBC Meeting: Learn all about eBikes on June 20 at the New City Library. Our guest speaker will be Edward Busk, the owner of Sleek eBikes in Tarrytown. He will be talking about the newest trend in bikes and will have a few to try out in the parking lot after the meeting. 7pm, 220 N Main St, New City. Weekly Ride Highlights: Sign up NOW for the Sun June 10 Multi Club Ride hosted by the Westchester Cycling Club. There are three routes from which to choose (28, 50 and 59 miles) with groups riding at different speeds on each route. Registration by June 6 is required. What gets said on June 12 affects all of us: Did you know there were 52 crashes between 2015 and 2017 in the Nyacks and Valley Cottage? That doesn’t include two fatalities this year in February and May in Nyack. On June 12 at 7p at Nyack High School, The Greater Nyack Bike/Walk Master Plan project presents its recommendations to create a bicycle network that covers the Nyack river villages and hamlets in the Nyack School District. This meeting is open to the general public. Looking ahead: September 23 is the date for the first ever Rockland County Century. On June 9-10, escape to rows of rich black fields standing guard like soldiers against the pressure of the world's most iconic urban landscape on the Farm to Fork Fondo - Hudson Valley, Warwick Valley Winery, Warwick, NY. Discover Hudson Valley: On June 24, choose 15, 33, 55, 75 mile routes starting in Poughkeepsie, centered around the the world’s longest footbridge, the Walkway Over the Hudson. Join 650+ cyclists for eight days and 400 miles across New York State in the 20th annual Cycle the Erie Canal bike tour from Buffalo to Albany. July 8-15, 2018. Help Wanted! The RBC is seeking volunteers to help us with this newsletter and our website. Also, we are always looking for new ride leaders and new rides and routes, too! 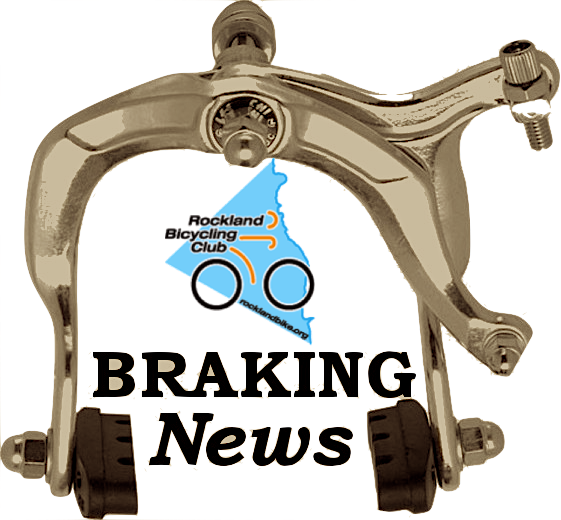 Email rocklandbike@gmail.com to get involved. Until then, Ride Safe!